White House: Not Ready To Endorse Equality ActUPDATE: Video Added To Post - Joe.My.God. 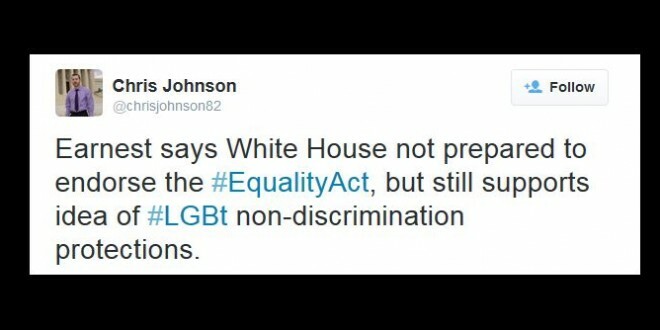 According to Washington Blade reporter Chris Johnson, White House Press Secretary Josh Earnest today said that President Obama isn’t prepared to endorse the Equality Act, which would essentially grant LGBT Americans the same federal protections enjoyed by Christians since the passage of the Civil Rights Act of 1964. How very disappointing. Nobody really expects the Equality Act to get any traction in the current Congress and it probably won’t in the next one either. But still. I expect we’ll see some strong pushback on this right away.